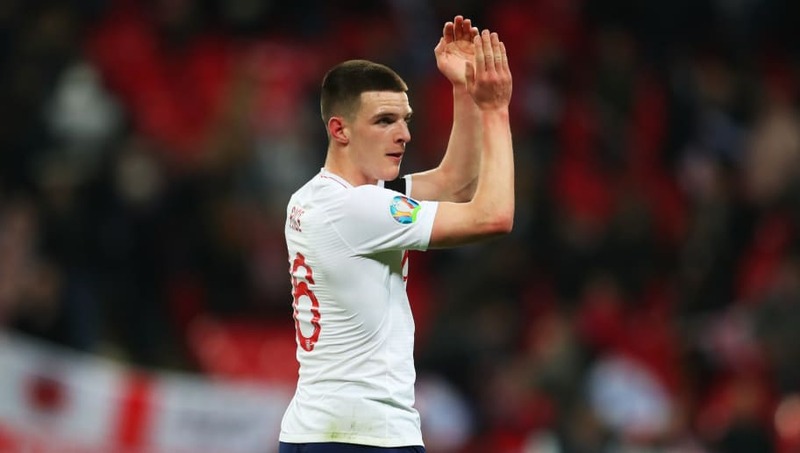 ​Declan Rice has described his England debut as a 'special night' after he appeared as a substitute during the Three Lions' 5-0 win against the Czech Republic on Friday. Rice had previously made three senior appearances for the Republic of Ireland but he announced earlier this year that he would be switching international allegiances to England. FIFA accepted the 20-year-old's decision as he had not made a competitive appearance for Ireland, having only previously featured in friendlies. Speaking about his England debut on Friday night, Rice tole West Ham TV, via the ​Irish Independent: "I'm really happy, as you can see. "To make my debut in front of 80,000 fans and to have my family here, my girlfriend, my brothers, it's special. To get the victory as well, I can't really put it into words, but it's a special night. "I probably won't think about it for a couple of days and then it will hit me. The manager just pulled me over and said: 'look, go out there and do what you've been doing for your club. You deserve this and go out there and do what you've been doing." The ​West Ham midfielder was also full of praise for Gareth Southgate, adding that the England manager's man-management style has helped him settle into the Three Lions squad. He added: "This week has been crazy. It's been really surreal, to be honest. I knew I'd be coming into a great camp, with a great manager and great players. "You hear a lot of stuff about how good he is at man-management and how he is with the players, and I have to say he has been top drawer with me. "He gives you the confidence to go out and play, and he wants you to express yourself."